Once in a while you get the chance to play as a divine being. When this is coupled to a well narrated backstory, it is all the more welcome. 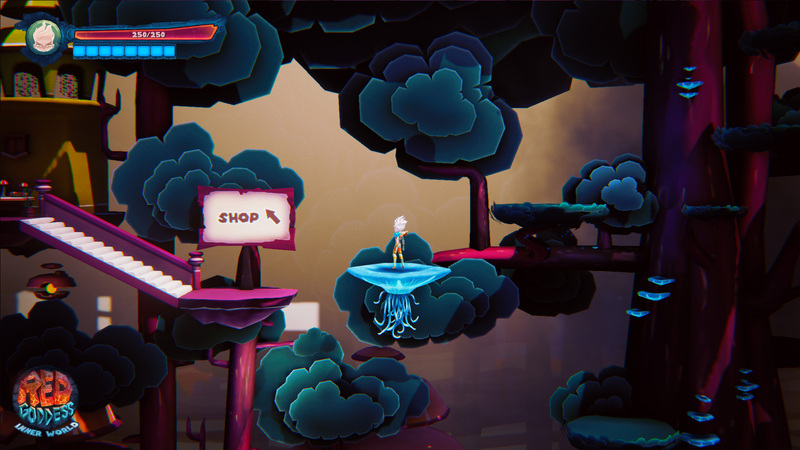 Red Goddess: Inner World is a one of a kind game that tells the story of Divine, a young white haired goddess suffering from amnesia, in a brandnew sidescroller adventure. Delve deep into her locked memory to uncover the past in an attempt to save the future. When disaster strikes the world of the gods, only Divine, the daughter of the royal couple, manages to escape. Travelling far and beyond the starry skies, the young goddess awakes in a strange world, stripped of both her memory as her godly powers. Ushered on by a voice, Divine sets out to explore in search for the harsh truths buried in her past. The story is being told in various ways. The most prominent one is through the voice of the mysterious Narrator character. This invisible NPC doesn’t simply recount backstories and frequently tries to mislead the player into ignoring vital progression steps. Feedback is on one hand given by comic book style speech bubbles, while on the other hand entities from Divine’s tumultuous past aid in recovering oppressed memories. Unfortunately, the text is not up to standard. It quickly becomes clear that English is not the creator’s main language. This is a major setback, especially for a game that has this large of a focus on storytelling. An updated translation would surely be able to fix this in a future update. The world presented in Red Goddess can only be described as seeping in fairy-tale allure. The colourful backgrounds and characters combined with its poetic effects bring a certain depth to this sidescrolling title. Of course, a perfect marriage of colours and contrast does not immediately mean the graphics as a whole are impeccable. Red Goddess definitely has its flaws, which become most apparent during scenes in which you wait for something to move. Unexpected frame rate drops, however short or local they might be, do unfortunately occur. Luckily these are not at all game breaking. Another point Red Goddess does right, is the game’s soundtrack. No matter where you are in the world, the charming music sets the mood quite well. The voice acting for the narrator further compliments the ambiance well, despite the sometimes lacking text the voice actor had to work with. The soothing, neutral voice quickly but subtly grows more and more vicious towards the protagonist, adding welcome confusion to the presented mysteries. The narration however underlines the otherworldly grunting other NPCs do. This strange contrast makes it feel as if several dreamy ideas were mixed with the expectation of getting a wonderful cake, only to realise in the end that little bit of pepper maybe wasn’t the culinary highlight of the day after all. Had the grunts been replaced by short general replies like ‘Hello’, ‘Hey you’ or ‘Welcome back’, the gap with the narration might have been less obvious. 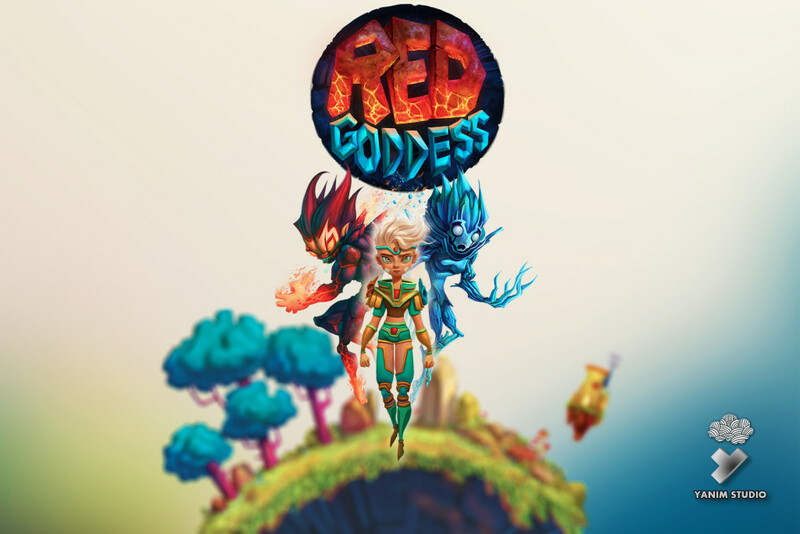 Red Goddess is a typical sidescroller platform adventure. 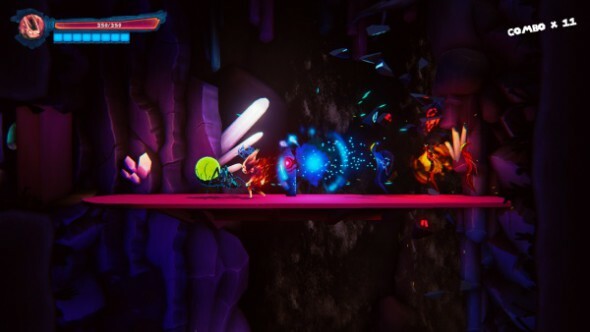 The player takes control of Divine, using the left analog stick to move around the world and collect coins and red crystals. 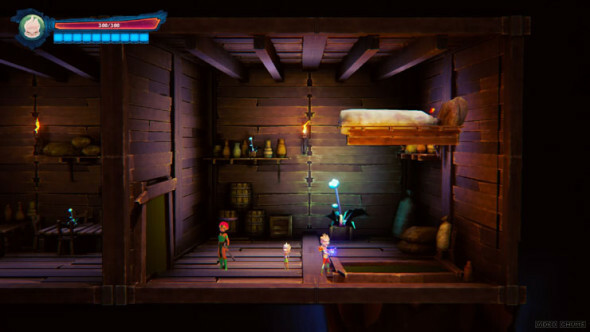 The former are used to buy extra health and MP throughout the game, whereas the latter are used to unlock doors to new areas. Character development in form of unlocking new powers is linked to the narration. Divine’s godly gifts become available once she remembers certain events that have taken place in her past. As Divine regains control over her previously lost abilities and memories, the goddess quickly learns how to get past various colour coded blockades and traps in order to further her quest. All of these obstacles, including enemies, are entirely power specific and are colour coded accordingly for easy identification. There are various powers to unlock and master in this game. Most of these new skills are part of your ancient armour, which offers you the power of telekinesis through a magical diadem and powerful shoulder guards that help Divine become the physical representation of her own Anger and Fear. These last ones, the so-called Mask Powers, unfortunately come at a price. Well, unfortunate for Divine that is, as the negativity of these feelings further warp the world around the protagonist. When a mask power is unlocked, the world reacts by sending out the primary enemies in Red Goddess: Negative Thoughts. Born out of Divine’s own wrath and dread, they corrupt the planet while trying to take the little white haired goddess down. Thoughts come in various forms and colours. Red ones can only be defeated by Anger while blue ones need to be beaten by Fear, a mechanism that perfectly ties in with the established rules to get rid of blockades. The stronger enemies can pose a problem though, as their weaponry and heightened armour come with stronger attacks and heightened defence. Because these can easily take you down when you’re not paying proper attention while using a Mask Power, they are actually taken down easier when you use fireballs to stun them. After that, using the same power to temporarily take over their bodies and have them explode in the faces of other enemies make combat a tad less button-smashy. Although this promises an incredible combat system, the truth is quite the contrary: enemies gang up on you while the game lags behind, making switching between the various forms trickier than it should be. It quickly becomes incredibly obnoxious to be sent back to the last checkpoint you’ve encountered while the Narrator delights in schadenfreude… This is unfortunate, because the switching isn’t optimal at all and thus it feels as if the brawling side was forced in instead of well thought over. Simpler fighting mechanisms or better enemy behaviour may be able to resolve this. 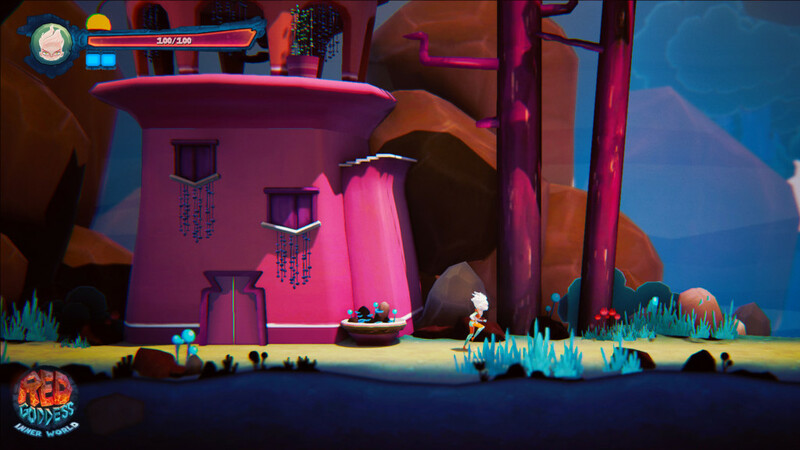 Red Goddess Inner World is a colourful sidescroller platform adventure game. The fairy-tale atmosphere nicely fits the theme of the game. The soundtrack and graphics are more than decent, yet the gameplay -especially the battle system- urgently needs some additional work to be called amazing. The character development is surprisingly interesting though, especially with the unlockable powers and transformations which are linked to heartbreaking secrets. However, because switching between the various skills can be quite sluggish, battling is a lot less enjoyable than it could have been. Not all is lost though. Should any future patch bring an updated English storyline and a better enemy AI, then Red Goddess: Inner World could become a classic. Until then, the game is still worth checking out if you are into deep fantasy themed storylines.